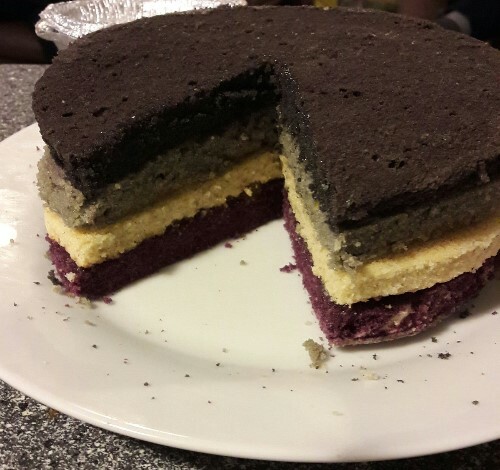 A cake with layers whose colors are the asexual flag. Image source. 1. How Did Saying “Merry Christmas” Become a Judeo-Christian Value? (posted October 17) "The problem, I suspect, is that people sometimes forget that Judeo-Christian is not a synonym for evangelical Christian—because, and let’s be frank, that is how it is used." 2. An Indiana county just halted a lifesaving needle exchange program, citing the Bible (posted October 20) You'll be shocked to hear that the bible verse they cited doesn't have anything to do with needle exchange programs. Also, they literally said "morals" was the reason to NOT approve a program that saves lives. Just goes to show in conservative-Christian-land, "morals" doesn't actually mean morals at all. It never did. 3. Get a Thumbs-Up from Trick-Or-Treaters with This BB-8-O'-Lantern (posted October 18) NICE. 4. Ace Community Census. A survey to gather data on the asexual community. Go over and take it~ Even if you're not asexual you can still take it- they want some non-asexual data to compare with. 5. The 'orphan' I adopted from Uganda already had a family (posted October 13) "The travesty in this injustice is beyond words. I must be clear in the following statement: My race, country of origin, wealth (though small, it's greater than that of the vast majority of people in the world), my access to "things," my religion -- none of these privileges entitles me to the children of the poor, voiceless and underprivileged." 6. On Protecting Women from Abusers, Franklin Graham Is an Opportunist and a Hypocrite (posted October 25) "In early 2016, when Naghmeh Abedini accused her husband, Saeed Abedini, of abusing her, Graham immediately sided with her alleged abuser. Graham undermined her statements publicly and went so far as to suggest, again publicly, that she was doing the devil’s work." 7. The rules about responding to call outs aren’t working (posted October 24) "Like most formal descriptions of social skills, the rules don’t quite match reality."